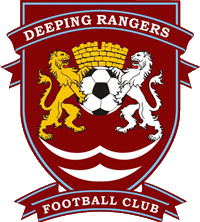 Deeping Rangers were founded in 1964 as a Sunday league team, initially playing in the Peterborough Sunday League for two seasons before switching to Saturday football in 1966, at which point they joined the Peterborough & District League. They won Division 3 North at the first attempt, before winning Division 2 in 1969 and Division 1 a year later. In 1979, Deeping were relegated back to Division 2, but bounced back at the first attempt. In 1985, the club moved into their current home, having left their previous ground in 1982. The move to Outgang Road was swiftly followed by promotion to the Premier Division, in which the club finished runners-up in 1995/96 and 1998/99, earning promotion to Division 1 of the United Counties League in the latter campaign. Promotion to the Premier Division of the United Counties League followed in the 2000/01 season. Initially, performances at this higher level were mixed, but in 2006/07 the club set a league record, going 28 league games unbeaten and winning the title as a result. However, the club did not take up promotion to Step 4, so they have stayed in the United Counties League Premier Division, with the best finish since the title-winning campaign coming last season when Deeping finished 2nd to runaway champions Peterborough Sports. In the FA Cup, Deeping have made it as far as the 2nd Qualifying Round on three occasions, the most recent of which came earlier this season, when they beat Peterborough Northern Star, Barton Rovers and Brocton before losing to Kidderminster Harriers in a game that was featured live on television and on the BBC Sport website. In the FA Vase, Deeping's best run has been to the 3rd Round, but they are currently in with a chance to beat that, having beaten FC Bolsover and Godmanchester Rovers to set up a 3rd Round tie with Hinckley AFC. Originally, I had not even considered visiting Deeping Rangers on this day, as I was instead planning to go to Yaxley's away game at Boston Town to tick off that ground. In fact, my dad had driven us into Boston early in the morning to do some shopping before the game. However, news filtered through on Twitter at around 11:30am that this game had been postponed due to a waterlogged pitch, so I quickly started looking for nearby options. I initially suggested Skegness Town and Sleaford Town to my dad - while we ate lunch in a Wetherspoons - but he didn't particularly want to drive further north on this occasion (this turned out to be unfortunate, as the game at Skegness finished 6-5, I seem to recall). Eventually, I saw that Deeping had announced on Twitter that their game against Newport Pagnell was on and, with it being direct on the way back home from Boston, my dad agreed to take us there. Thankfully, after stopping at Asda on the way out of Boston - to pick up some food and drinks for the game - we made it to the ground well before kick-off, giving me plenty of time to do a circuit of photos round the ground and pick up a pin badge from the club shop. This was a poor game between two sides seemingly lacking any kind of attacking talent to break down the opposition with. Instead, other than a brief ten minute spell in the second half - when Newport Pagnell scored both of their goals - both teams were mostly playing hoofball, with lots of niggly fouls and awful finishing in between. In that ten minute spell at the start of the second half, Luke Emery scored two goals for Newport Pagnell, the first a tap-in after two previous chances had been missed and the second was a good goal coming from a quick attacking move by Newport Pagnell. At the end, Newport Pagnell's Dom Lawless missed two absolute sitters that he really should have scored to put the game to bed with. Outgang Road is another good Step 5 ground, one that probably doesn't need a massive amount of work to be good enough for Step 4 (which is fortunate for Deeping, as it looks entirely possible that they will get promoted to Step 4 in the next couple of seasons). The main stand is an intriguing and unique design, with a strange roof and with half of it being seating (164 seats, in all) and the rest standing (probably enough room for 50-100 people, at a guess). It definitely gives the ground a bit of character, which is nice when the other covered areas are all much more "industrial" in design by comparison: all three seem to be mostly made of scaffolding (which makes sense, with a construction company being a major club sponsor), with the area behind the near goal looking as if it could fit around 100 people if necessary. The other two covered areas - one each side of the dugouts - are smaller and could probably fit 50 people each. However, what makes these odd is that you have to walk in front of the dugouts to get from one to the other (without doing a full circuit again, that is). In any case, the rest of the ground is open hard standing, with an overall capacity of 2,000. The record attendance at the ground is 696 for the FA Cup tie against Kidderminster Harriers earlier this season.